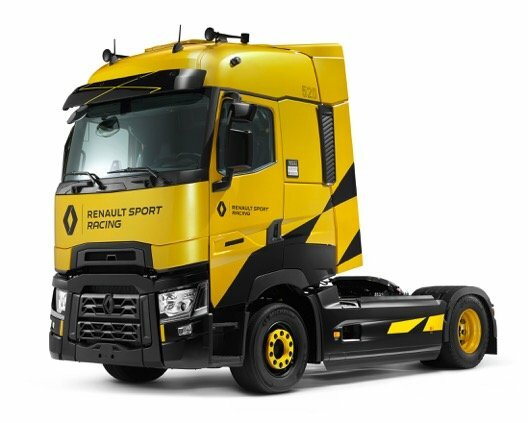 A special new limited edition series of trucks is now available to order from Renault Trucks as the French truck brand and Renault Sport Racing have combined their expertise to produce the Range T High Renault Sport Racing. Boasting an elegant, sporty look, featuring Sirius yellow paint – the iconic colour of the F1 Renault Sport Racing team – together with the yellow and black check that forms the striking livery of all Renault Sport models, production is being restricted to just 100 vehicles. However, operators in the UK and Ireland will be pleased to know that ten 6×2 versions of this highly sought-after model will be available to purchase. Different textures and shades of black contrast with the yellow: the wing mirrors of the Range T High Renault Sport Racing have been given a coat of shiny black paint, as have the diamond and the radiator grill. To highlight the sporting design of the vehicle, the yellow and black check features again on the side deflectors. Last but not least, each vehicle of this limited series has a numbered black ID plate. The cab has also been specially designed, featuring top-of-the-range equipment and yellow and black colours to match the exterior. The Recaro seats and steering wheel are both covered in black leather with yellow stitching. The bunk and floor mat also have yellow stitching, whilst the panoramic dashboard has a carbon finish, the air vents are circled in yellow and, to complete the sporting look, the seat belt is fitted with a yellow sleeve. 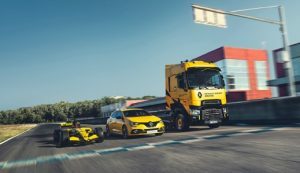 The new Range T High Renault Sport Racing edition has a completely flat floor, is fitted with a 13-litre 520hp engine and an Optidriver automated gearbox that combines on-board comfort, driving pleasure and performance.